What exactly are glass railings? Glass railings typically utilize tempered glass. The tempering process adds structural rigidity and prevents against cracking and damage. 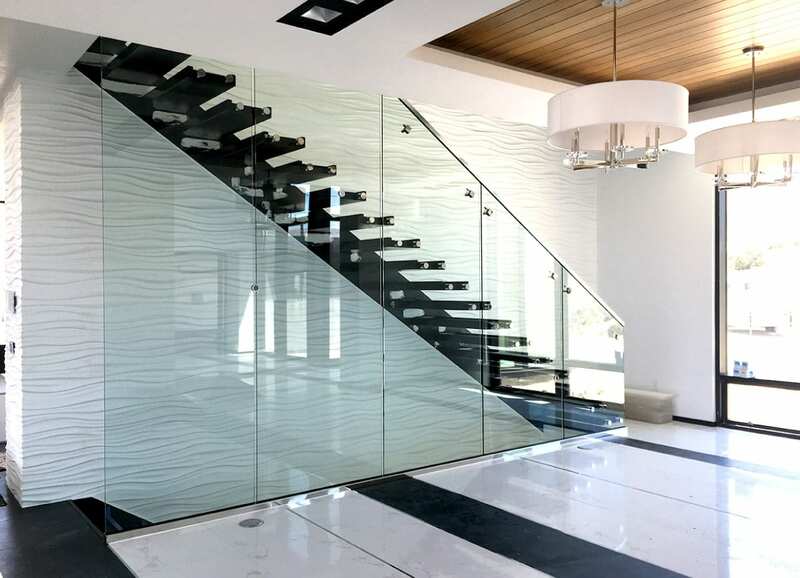 Many modern home builders turn to glass railings for their customizable elegant design potential and low maintenance. Glass railings are the future of railing systems with their sleek design, low required maintenance, and great customization potential. Staircases, decks, walkways, and pools are all great places to utilize glass railings. Not only are glass railing systems versatile and aesthetic, they are also a practical design solution. There are several reasons you might consider installing a glass railing system in a home or office. Light and visibility are primary concerns when designing a living space. Glass railing systems provide a cost effective and versatile solution to these design challenges. Add railings to a staircase in your home, around a deck or pool in your backyard, or at your business, to open up any space. Wooden or metal railings can be bulky, decrease visibility, and even block sunlight from entering the room. Glass railing systems; however, offer a sleek design that allows natural sunlight to radiate in and make the space feel much more open. Unlike wooden railings, glass railing systems require little maintenance. In internal applications, wood systems require continual polishing and staining to preserve their color and shine. When wooden railings are outside, the maintenance required skyrockets. Exposure to sun, wind, and water cause the railings to weather rapidly. Glass railings don’t weather nearly as fast or require regular maintenance. Simply cleaning the glass with soap and water will make them look like new instantly. In addition to their modern design, glass railing systems are safe and extremely durable. Glass railings provide a way to ensure safety on decks and staircases, preventing the possibility of a fall. They also offer protection from the external elements when installed outdoors. 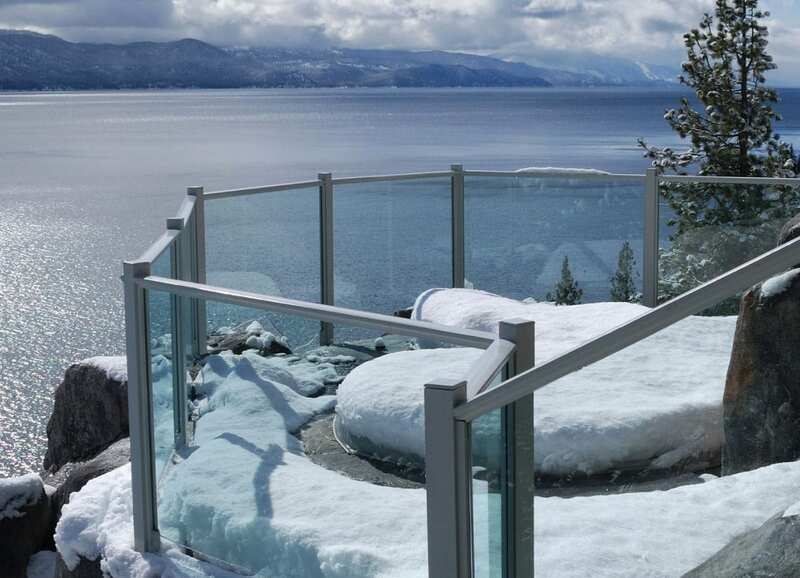 Glass railing systems function as a barrier against strong winds, rain, and heavy snowfall. Glass railings will not corrode due to water exposure, crack due to extreme temperatures, or change color due to any number of factors. The tempered glass panels are designed to withstand all of the possible environmental factors, unlike wooden surfaces. After a couple years, wooden railings are generally weathered and in need of repair or replacement. Glass railings offer excellent durability and will continue to look great for a much longer period of time. Glass railing systems are highly customizable, allowing every space to be uniquely designed. Whether you are looking for a completely open room or would like a little more privacy, glass railings can be created to fit those needs. Customize the glass by changing the shape, size, and transparency. For greater privacy, consider blurring or frosting the surface of the glass.